After some recent research, I have added Catholic Fathers Henri Desjardins, Omer Leblanc and Leo Poirier to the In Memoriam page on this site. They were working on Mindanao as members of the Société des Missions-Étrangères du Québec (Societas pro missionibus exteris Provinciae Quebecensis’), shortened P.M.E. None of these men were ever interned and a fourth member, Fr. Leo Lamy, died of malaria, on 19 December 1942. 6 of the PME Fathers who escaped the Japanese and internment. Baganga, 1942. 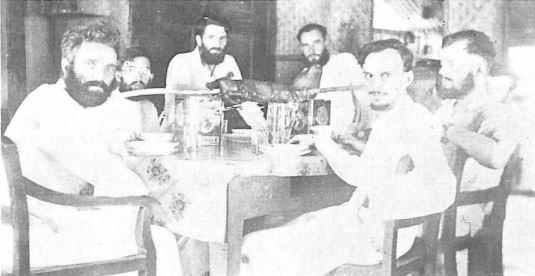 Davao: The Frontier Society and the Initial Efforts of the PME, 1987, which appeared in vol. 4 of the journal Tambara. The Canadian War Crimes Liaison Detachment – Far East and the Prosecution of Japanese “Minor” War Crimes, 2013, Ph.D. dissertation by Mark Sweeney.